Gene Frankel's tutelage had touched countless actors, and led many of them to success. His classrooms had produced a wealth of talent, whose influence is seen in all aspects of theatre, film, and television. Walter Matthau, Anne Bancroft, and Raul Julia are a few of the many successes who have been taught or directed by Frankel. 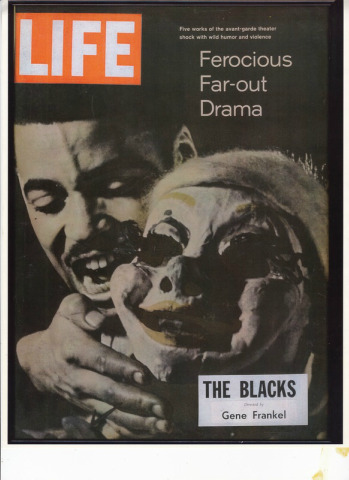 Frankel's 1961 production of Jean Genet's "The Blacks" at once launched the careers of James Earl Jones, Cicely Tyson, Louis Gossett, Jr., Maya Angelou, and Roscoe Lee Browne. Praised by critics and audiences alike, it is regarded as one of the most important productions in recent U.S. theatre history--a seminal production in African-American theatre. Stuart Little's book "Off-Broadway: The Prophetic Theatre" lists Frankel among "those rare few who put theatre above self and made Off-Broadway the advance post of the American theatre." Frankel himself offers a simple explanation for the creation of Off-Broadway theatre: "We wanted to do theatre and we did it." Not the type of artist to wait for things to happen for him, Frankel had made his own breaks. Among his first theatrical accomplishments were street-theatre productions during the Depression. Since that time, he had founded about a dozen theatres, each one springing from his passion for and devotion to his art. The products of that passion had made Frankel a well-decorated director. He won the first Obie award for directing, for his 1958 production of "Volpone," and had won two since. He also received the first Lola d'Annunzi and Vernon Rice awards for outstanding achievement in theatre. Frankel's success had not been without its share of disappointment. Except for his most recent address, 24 Bond Street, all of his theatres had closed or changed hands. One collapsed--literally. The Mercer Arts Center, which he founded in conjunction with Viveca Lindfors, Rip Torn, Steina and Woedy Vasulka, and others, fell upon itself on Aug. 4, 1973. This was the day Frankel's production of Peter Swet's "The Interview" was supposed to open. The Mercer Arts Center, heralded as "the Lincoln Center of Off-Broadway," housed six theatres, two acting workshops, and a rock club, all of which were designed to nurture budding talent. The Center's structural collapse ended the 1,OOO-performance run of "One Flew Over the Cuckoo's Nest." Both that show and "The Interview" found new venues, but the Mercer Arts Center was never restored, and its like has not been seen since. Gene Frankel moved his theatre to 24 Bond Street 1989. It became a successful place of learning and theatre productions. In 2003 Gene made Gail Thacker manager. The Gene Frankel Theatre is open and alive with Gail Thacker at the helm. Frankel had directed in several countries, and in theatres of all sizes. His direction also extended to a few films and a number of "Plays of the Week" for New York's public television station, as well as other TV work. He found that while the bulk of the business had shifted from the stage to the camera, his heart remained in theatre. "There is an excitement in the theatre that I can't get anywhere else. People who have done it always say that they prefer the theatre. There is nothing like that live audience." While he had directed in theatres of all sizes, Frankel was admittedly more comfortable. with the Off-Broadway venues. "You can do things Off-Broadway that you can't do on Broadway. I'd much rather work Off-Broadway. The audience is more discriminating and knowledgeable," he said. Frankel's theatre encompassed a wide variety of styles and techniques. However, he would shirk away from realism. "The best of theatre is not just real. It is a flight into reality. It is the real taken and stretched to an artistic pinnacle." Frankel loved his time was spent in the classroom. He taught four classes, for serious actors at all stages in their careers. Many of his accomplished and well-known students would frequently come to his workshops for instruction. He felt that all actors can benefit from training, no matter what their level. There is always more to learn, and he always had more to teach. Frankel believed that acting is much more than entertainment, and should be treated as such. "Acting is communication and should be taught universally as a language," he said.. "The ability to see truth and communicate that truth to an audience is a great achievement." He helped actors reach that goal of truth throughout his professional life, and had no intention of stopping. He also worked with a class of playwrights and directors at the Gene Frankel Workshop, and had four other instructors who taught classes in aspects of the industry that are not Frankel's favorites. The workshop offered classes in musical theatre, film and television, and comic acting, as well as basic acting classes. The Gene Frankel Theatre also offered Summerfest, an intensive seven-week summer-training period that explores all aspects of acting and offers seminars by celebrity guest artists. Frankel’s more advanced students were invited to participate in the showcases that he directed. He felt this experience is just as important as any class instruction. "All the great acting schools have worked with theatres. The experience of an audience is essential." According to Frankel, a good teacher is essential for any actor, no matter how talented the artist. "Before you agree to do a showcase, make sure you've picked a good director, someone with theatre sensibility," he advised. Gene Frankel passed away in November of 2005. His assisant Gail Thacker is now manager and artistic director of The Gene Frankel Theatre.